Committee Room I: Good day for the lawyers here; they enjoyed the debates on procedural issues, although there were not many alterations. The previous decisions on secret ballots remains unchanged. Capacity building was the topic in Committee Room II. 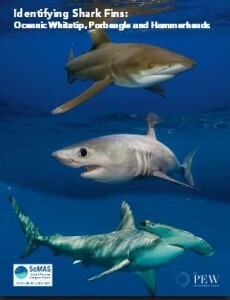 Honduras, Brazil, Ecuador, Costa Rica, Colombia, the European Union and the United States hosted an event to discuss the shark and manta ray proposals. The event included demonstration for how shark and manta products can be easily identified in trade. The simple key in Identifying Shark Fins: Oceanic Whitetip, Porbeagle and Hammerheads, a publication produced by PEW, makes it easy for customs officials to determine species origin. Dr. Demian Chapman's also gave a presentation on identification of manta and mobula dried gill rakers (the only part of mantas in trade). National Geographic screening a film "Battle for Elephants" this evening and WildAid/Freeland Thailand are hosting a reception this evening.